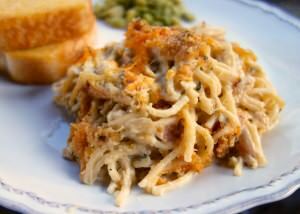 In a large bowl, combine the chicken, spaghetti, soup, broth, sour cream, butter, cayenne, parsley, salt, pepper, Italian seasoning and parmesan. Lightly spray a baking dish with cooking spray and pour the mix into the dish. Top with cheddar cheese and breadcrumbs. Bake for 30 to 40 minutes or until golden and bubbly.